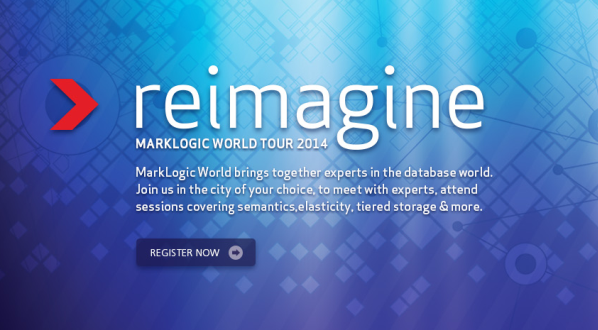 May 15th, the MarkLogic World Tour touched down in Amsterdam. Approximately 300 attendees flocked the Amsterdam Arena to be immersed in MarkLogic and it possibilities. As longstanding MarkLogic partner and implementer, my employer Dayon and HintTech sponsored this event. MarkLogic presented interesting new Developments, Case studies and Technical Sessions. Keynote speaker an MarkLogic CEO Gary Bloom and Joe Pasqua, Senior Vice President of Product Strategy explained MarkLogic choices for addressing Big Data challenges, but also the Big Content challenges (see my earlier blog) such as Heterogenic structured data: supporting Multi Schema XML and changing schema's. A very interesting feature, which I could use immediately: What did we know at a certain point in time? Some of our customers presented as well: Ted van Dongen of Swets told how a great tool needs good people to implement. Thanks for the compliments Ted! Our (previously) own Michel de Ru contributed for Newz to a panel session on Sharing Data despite the Silos. I will admit to anyone that I am biased: I think MarkLogic is a great tool that solves many challenges my customers face. But I had an interesting discussion: with all these new features, will MarkLogic become a too monolithic solution? Can you have too much of a good thing? My 2 eurocents are: For now, keep piling on the good stuff, MarkLogic!